Since we are still fresh on the subject of giants I wanted to cover this next story. There is an article by soul gudince.com that talks about giants and a mysterious tribe that possess 6 fingers.if you have been following my channel or my videos about giants then you are well aware that it is believed by many that giants once roamed the earth and they had 6 fingers, 6 toes and 2 rows of teeth. And I just found out thanks to this article that there is a tribe in Ecuador where some people do have 6 fingers, 6 toes and sometimes even 2 rows of teeth, but it is rare. And when scientist looked into this they uncovered that the people within this tribe posses an ancient gene within their D.N.A making it possible for them to sometimes be born with these features. And this gene is healthy meaning it is not caused by some fluke mutation or radiation. So the question is how did they get this gene as 99.9 percent of the rest of the human population don’t have it. Now not that long ago in Ecuador archeologist found an ancient city buried deep in the jungle. And they a now calling this site the city of the lost giants as these structures are just enormous. And many believe that this is one of the biggest discoveries in a very long time in regards to archeology. But yet main stream science is choosing to ignore it. And the people within this region have been telling us for a very long time that giants once roamed these lands. And we have even found a lot of ancient tools within this ancient city that are just to big for humans to use. Then in 2013 an expedition found dozens of very large skeletons in Ecuador. And after this discovery they sent these bones to Germany for testing but still to this day there hasn’t been any updates about it, it’s as if this never happened. So what is going on here did some powerful agency or shadow government intervene like the did in Europe in Georgia. Well at least that is what many people believe. And for those that haven’t seen that video in 2008 a group of Georgian researchers heard an amazing story from a herdsman about a farmer who a long time ago stumbled upon a very old stone crypt. And within this crypt he saw 2 giant skeletons siting on very large chairs. And this research team was amazed by this story so they decided to go check it out. And off the went into this very remote region in the lesser Caucasus mountains. And after a lot of searching they did find this crypt but by that time it was in ruins as it had collapsed on itself. And after a lot digging and searching they did find some very unusual large skeletons that appeared to be human. And they sent these bones to a very famous scientist. But before he could analyze them and come to a final conclusion he died and yet again the bones disappeared. Now giant bones have been allegedly found all throughout the world and Ecuador is a huge hotspot. Making some believe that this tribe sometime in their past must have mated with this race of giants, giving them this gene. Another interesting thing about this tribe is that they don’t get cancer, they have no allergies, and they don’t have any known diseases that we are plagued with today. And also they are very violent as most of them die either by fighting with other tribes or by murdering one another. Making these people very unique and very interesting. And there is a lot of ancient artwork found all throughout the world describing people or giants that had 6 fingers and 6 toes. Another discovery that I wanted to talk about today and one that I have been getting a lot of request for is the giant skeleton that is on display in an Ecuador museum. 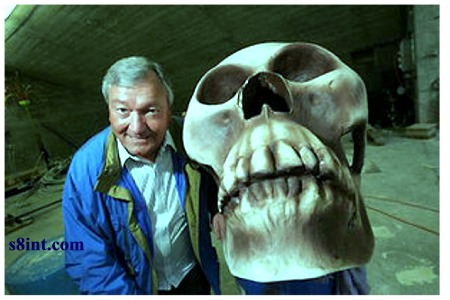 According to the story back in 2012 somebody found remains of a giant skeleton. Not much just a couple of bone fragments, part of a skull a heel fragment, etc.. And they estimated that this human or primate must have been at least 7 to 8 meters in length, 22 to 26 feet tall. And they decided to reconstructed it and put it on display in a museum in Ecuador. Now I couldn’t find any evidence about this discovery but I did uncover that this giant is not in Ecuador it is in Sweden and it’s not real. It was made for Erich von Däniken’s ancient astronaut theme park or mystery park. Now sadly there are a lot of hoaxes out there today in regards to anything paranormal. And even with the internet at everybody’s finger tips it can still be hard to uncover the real truth behind a story. But there is no doubt in my mind that there have been a lot of credible people who have found giant skeletons. And many believe that there are some very powerful people who will stop at noting to hide this information from us. So if you every get lucky enough to find evidence of this ancient race of giants make sure to get as much proof as you can before they disappear. « Did Giants Once Live On Catalina Island?